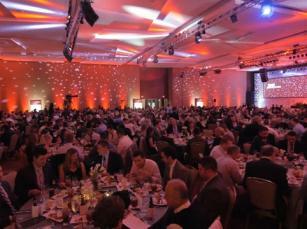 Thinking of planning an event at the Irving Convention Center at Las Colinas? Thanks to a stunning design, luxurious details, exceptional amenities, award-winning staff, and flexible layout options, events here are distinct. Planning your event at the Irving Convention Center is easy and simple, and we’ve got all the resources to make your event a success. The Irving Convention Center hosts all types of events each year, including meetings and conferences, weddings, and social events, covering everything from parties to expos, trade shows to holiday luncheons. The Irving Convention Center is a large venue. With 275,000 square feet of Silver LEED certified meeting space, it is capable of hosting events large and small. Whether you want your event to feel grand or intimate, or somewhere in between, the Irving Convention Center can be customized to meet your needs. Divided into three spacious floors, including a generous column-free exhibition hall, the venue has a junior ballroom, 20 breakout rooms each averaging 1,000 square feet, and a 20,000-square-foot grand ballroom perfect for large-scale events. Both ballrooms include a pre-function space, ideal for registration or mingling. There is also a cafe available for use along with multiple outdoor terraces that can be incorporated into any event. To see the space and learn more about the Irving Convention Center, take a virtual tour or browse through the media gallery. To understand how the venue is arranged and how you can customize it for your next event, examine the layout and capacities. To start planning your Irving Convention Center event today, access helpful exhibitor tools and learn about the venue’s loading areas. And, for a shareable takeaway of the Irving Convention Center, download the Quick Reference Guide. The Irving Convention Center provides resources to help Irving meeting and event planners achieve flawless event execution. Food and beverage services for all events are provided exclusively by Savor Las Colinas, helping you to plan custom catering menus for everything from breakfast to hors d&apos;oeuvres, multi-course dinners to desserts and snacks. For event planning support, browse the Event Planning Guide and Event Checklist. Multiple options are available online for meeting and event planners to submit a request for proposal (RFP) for rooms or meeting space. Of course, if you have any questions along the way, do not hesitate to contact the staff here at the Irving Convention Center.